Guest blogger Susan Gruff was Curator of the Cornell Plant Pathology Herbarium until her retirement in 2007. With over a quarter of a century of daily dealings in the Herbarium, Susan has some stories to tell. There are thousands upon thousands of interesting specimens contained in the Cornell Plant Pathology Herbarium. Every now and then, an extraordinary specimen is uncovered — an apocryphal specimen, if you will. I was adding data for Aleurodiscus specimens to our database and decided to add the few remaining specimens in the same drawer. When I came to CUP 25787, I found a wonderful surprise. The label seemed ordinary enough; I expected to find a typical Stereum specimen in the box. Instead, I found the unexpected (below). This is, of course, a joke. Stereum is a genus of bracket fungi with a smooth undersurface lacking gills or pores. 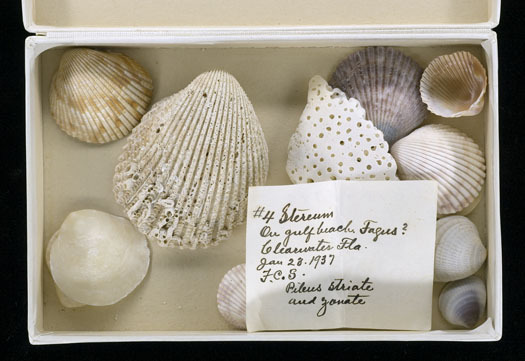 The epithet “seashellia” gives away the actual identity of the specimens in the box. And Fagus is the genus name of beech trees (beech. beach. get it?). Fred Carleton Stewart was a native of French Creek, New York, who got his BS (1892) and MS (1894) degrees from Iowa State University.1 He was Assistant Botanist of the Iowa Agricultural Experiment Station from 1891 to 1894 where he worked with Professor L. H. Pammel, Botanist of the Station. Stewart’s training with Prof. Pammel strengthened his interest in plant diseases. 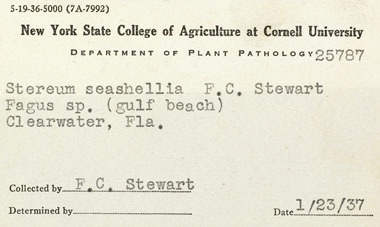 After a year off for additional training in plant pathology at Cornell and in Europe, in 1898 Stewart became Botanist and the Head of the Department of Botany of the New York Agricultural Experiment Station at Geneva. In 1923, the Station became part of Cornell University, and Stewart became a Professor of Botany at Cornell. Despite his duties as a plant pathologist, he also managed to publish a handful of papers on edible wild mushrooms and mushroom cultivation.e.g., 3 When he finally retired in 1936 he was granted the distinguished title of Professor Emeritus. Just a year later he sent us a message from retirement–a lovely box of seashells. We are currently pursuing a rumor that a mustache removed from a Victorian-era mycologist is somewhere in the herbarium. We’re sure Stewart would appreciate the humor in this, even if it turns out to be a scurrilous rumor. We’ll keep you posted. 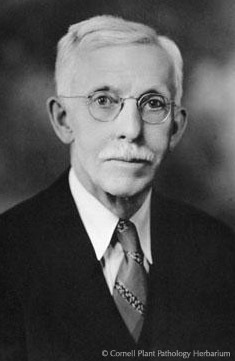 Fitzpatrick, Harry M. 1947. Fred Carleton Stewart: 1868-1946. Phytopathology 37: 687-697. Pataky, Jerald K. 2003. Stewart’s Wilt of Corn. APSnet Feature Story, July-Aug 2003. American Phytopathological Society. Photo of F.C. Stewart from the Cornell Plant Pathology Herbarium Photo Archives. CUP 31762a. That’s a touching story, and it did give me a bit of a chuckle. It’s always interesting to find humorous hidden easter egg type things like this that our predecessors have left behind.